PARIS, April 15, 2019 /PRNewswire/ -- According to thierry Ehrmann, the found and CEO of Artprice.com, "Our clients, with Artprice, can follow artworks from one appearance at auction to another, which give them insight into how collectors anticipate the Art Market and benefit from its long-term general evolution. When we take a look at the first quarter of 2019, for instance, we see that a large number of Fine Art auction lots have proved the extraordinary profitability of Art as an investment over the last thirty years. Of these the most spectacular was probably David Hockney's Henry Geldzahler and Christopher Scott (1969), which fetched the quarter's best result at over $49 million on 6 March 2019 at Christie's London. In November 1992, the same 2x3 metre canvas had sold for $1 million." 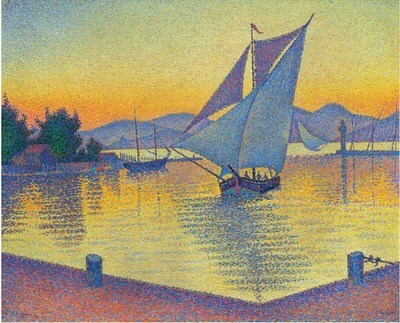 The price evolution of Paul Signac's Le Port au soleil couchant proves that the best financial returns are not reserved for Post-War and Contemporary artists. The upside on works by Jean-Michel Basquiat has been somewhat less publicized over the first part of 2019… and yet the American prodigy generated three of the ten best gains in the first quarter. On 5 March 2019 at Sotheby's London, his 1986 canvas Apex (painted two years before his death by drug overdose) reached $10.8 million, multiplying its value by no less than 370 times since its last auction in June 1988 when it sold for just $29,400. A pencil drawing entitled Soothsayer (1983) proves that Basquiat's success covers all of his production. Acquired for $32,900 in June 2002, this small work sold for $997,600 on 5 March 2019, representing an average annual return on investment of +22% over the last 17 years. We have seen this kind of price metamorphosis with lots of other artists as well. The Minimalist French artist, Daniel Buren (b. 1938) is today enjoying an extraordinary price ascension that is rewarding all the collectors who anticipated the power of his art a quarter of a century ago. His canvas Peinture acrylique blanche sur tissu rayé blanc et rouge, purchased $3,500 in 1997 at Libert-Castor in Paris, fetched $357,500 at Phillips in London on 8 March 2019. Hong Kong's recent prestige sales in the wake Art Basel Hong Kong generated a number of significant revaluations that benefit Asian collectors. The biggest rise in China during Q1 2019 came from a painting by Fengmian Lin (1900-1991) titled Wisteria. Twenty-seven years ago it sold for $15,000 at Sotheby's in New York. Since 2 April 2019, it is now worth over $1.3 million. The return to Hong Kong of great works by Chinese Modern artists, long traded on the Western marketplaces, can have a considerable impact on their value. But the development of the Hong Kong market over the last 30 years also benefits artists who have never left Asia. Take for example the latest result for an ink drawing by artist Yu Feian (1888-1959) entitled Parrot (1945). Purchased in Hong Kong in 1990 for $11,400, the same drawing resold for 70 times that amount in the same city (Sotheby's) on 2 April 2019 ($787,000). The Japanese artist Yayoi Kusama also, unsurprisingly, ranks among the most impressive price accretions in Q1. Today the most successful female artist on the global Art Market, with an auction turnover exceeding $100 million in 2018 (ahead of Louise Bourgeois and Joan Mitchell), Kusama has not always had this kind of success. In 2000, the record auction price for one of her paintings was just $80,000, whereas her Interminable Net # 4 (1959) fetched close to $8 million on 1 April at Sotheby's Hong Kong. In terms of revaluation, her sculpture Midsummer (1983), acquired for just $7,200 at Sotheby's in London in 2000, resold for $428,000 at the same auctioneer 19 years later. The prize for the most unexpected price jump in Q1 2019 must surely go to 17th century Flemish artist Michaelina Wautier. Long forgotten by art historians, Wautier was 'rediscovered' in 2018 with a first retrospective organized at the Museum aan de Stroom and at the Rubens House in Antwerp. The renewed attention had a profound impact on the prices of her works and her canvas A garland of flowers (1652) reached $471,000 on 30 January 2019 at Sotheby's in New York. In 1993, the strange bouquet with a hovering dragonfly sold for just $20,000.